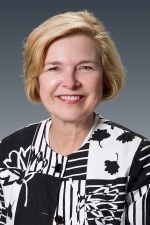 Janet is an experienced financial professional with over 30 years working in a variety of industries including the commercial real estate, family investment, and nonprofit sectors. She has an extensive financial and managerial background in accounting, financial and tax reporting, strategic planning and budgeting, treasury, human resources, and risk management. She is experienced in acquisitions and divestitures including transaction management and due diligence. As CFO of Fortin Group, Nitze-Stagen and Daniels Real Estate, Matthew G. Norton, and Agros International, Janet has played a key role on executive management teams, including serving as the interim CEO during the executive director search at Agros International. Also, she enjoys acting at a hands-on, day-to-day level as needed. She has extensive knowledge and background with respect to financial modeling, and her financial models have been instrumental in estate and business planning, and complex real estate cost allocations; enabling decision making, cost savings, and streamlined operations. 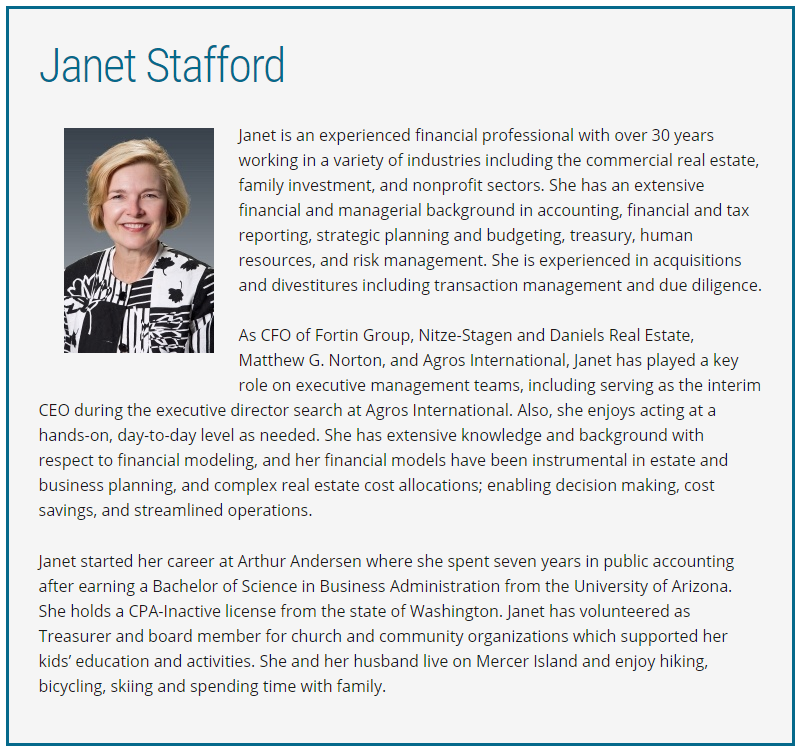 Janet started her career at Arthur Andersen where she spent seven years in public accounting after earning a Bachelor of Science in Business Administration from the University of Arizona. She holds a CPA-Inactive license from the state of Washington. Janet has volunteered as Treasurer and board member for church and community organizations which supported her kids’ education and activities. She and her husband live on Mercer Island and enjoy hiking, bicycling, skiing and spending time with family.